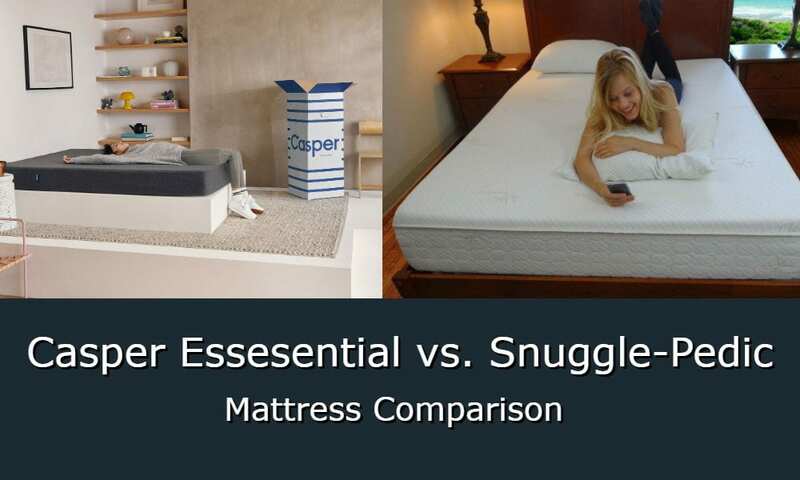 Let’s look at The Essential by Casper Sleep side-by-side with the Snuggle-Pedic Mattress. First of all, both mattresses are made in the United States. This puts them in contrast with many that are made in China and other East Asian countries. The advantage of this is in the quality of the materials. Some well-known companies import the foam for mattresses made here, and in a memory foam mattress, it is the quality of the foam that really counts. The 10″ high Snuggle-Pedic is 1½” higher than the 8½” Essential. It has only two layers, as opposed to Essential’s three. The Snuggle-Pedic’s comfort layer is 3″ of 4-lb/ft³ memory foam. This is the same height as the combined 2″ polyfoam and 1″ memory foam in The Casper Essential. Having four times as much memory foam gives the Snuggle-Pedic more pressure-relieving conformity. It’s hard to take advantage of the memory foam with only a 1” thickness. The Snuggle-Pedic’s base layer is 7” of 1.8-lb/ft³ polyurethane foam. In The Essential it is only 5½” high, which means less base support for the softer foam. Casper Sleep labels the top layer in The Essential Mattress as “Breathable top foam.” It does not say anything about how it is made breathable, whether this is just open-cell foam, or whether it is ventilated. Neither does it say anything about the breathability of the memory foam. There is some airflow into the mattress for cooling, but how it is done, how much, and how deep is not disclosed, bringing its effectiveness into question. The Snuggle-Pedic Mattress, on the other hand, uses the Airflow Transfer System patented by Select-A-Bed. This uses a combination of the Kool-Flow cover with knitted-in vents, vertical ventilation of the comfort layer(s), and horizontal air channels in the surface of the base layer to facilitate a greater flow of air through the mattress – hot air out, cool air in – than in mattresses without all three components, as illustrated in this video. Both the Snuggle-Pedic Mattress and Casper Essential are sold on Amazon, and both have customer reviews. The Essential has 153 customer reviews on Amazon with an average rating of 4.2 Stars which is somewhat higher ratings than the 4.0 Stars for Casper’s flagship mattress, The Casper. The Snuggle-Pedic Mattress has 310 customer reviews with a 4.6 Star average rating on Amazon.